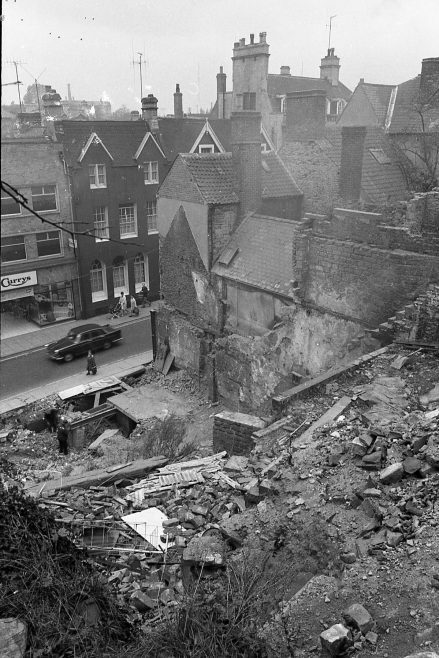 In the Museum Chad Negatives collection these photos are just listed as Church Street demolition. We know it is Church Street, Mansfield but the mystery is, what was the building/buildings they had demolished? Nostalgia pictures from the early ’70s ,yes Tom the Co-op shoe department did stand there for many years until it went into the Four Seasons Shopping Centre. Supersave took over the space and it started for the Mansfield folk a new anticlimax of different ways of shopping. Early days then for the likes of the big three today but the Mansfield folk saw it as a big change and challenge and how they could try to “Save” some pennies .Happy days and nostagia at its very best . I worked on the building of Supersafe shop and I think it was 1971. I remember that huge quantities of concrete were used as the walls and ceilings were made from it. There was a brisk trade in stolen meat amongst the gang working on site as a junior employee at the butchers next door was flogging joints of meat to them at discount prices, eventually he was found out and sacked but not before a good few legs of lamb had changed hands! There was also a very good ‘topping out’ celebration once the top storey was poured with large quantities of beer for the lads on site, happy days. 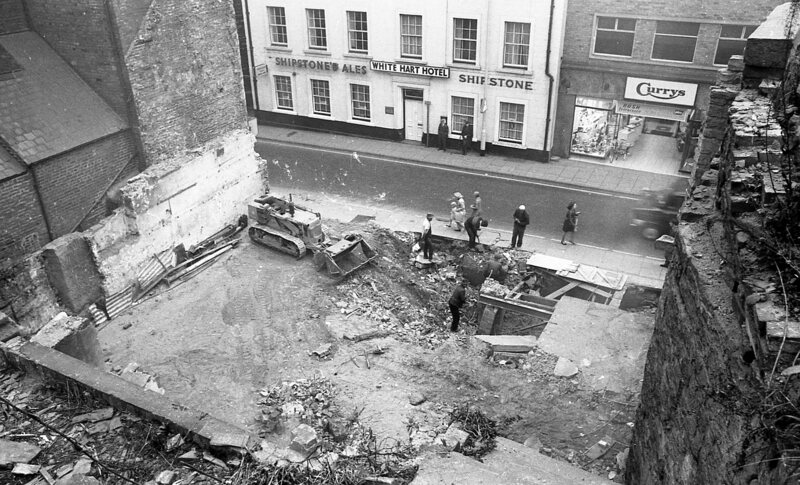 I am sure it is showing the clearance of the site for the Supersave building and I believe this was the first building in Mansfield to have an escalator fitted. Apart from the shop frontages the store took over in the changes that were made on Church St. Somewhere to the rear of them was a large garden with apple trees and plants. Steps leading down from a narrow gennel that opened from Leeming Street. Coming out at the side of a shop on Church St. The garden must have covered quite an area over the caves. 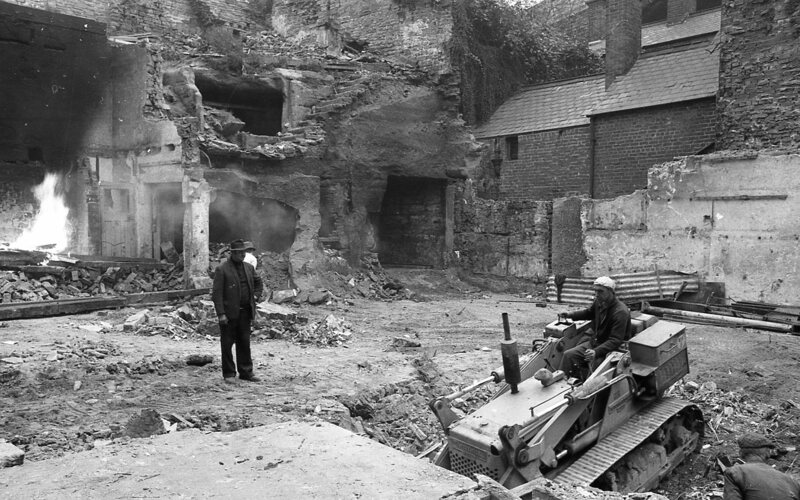 The rear of the shops covered much of the frontages to the original caves. These old caves must have been the shelter for the original Mansfield residents, many many years ago. Halfords bicycle shop was opposite to Curry’s with Shoecraft Repairs next door followed by Fords Drapers. Was it the Co-oP shoe dept and then the Supersave Store, [David Lee]. His previous shop was on Leeming St a couple of doors down from Handley Arcade, a big jump in size. I think this was the site of the food store Supersave which was two storied and had an escalator. 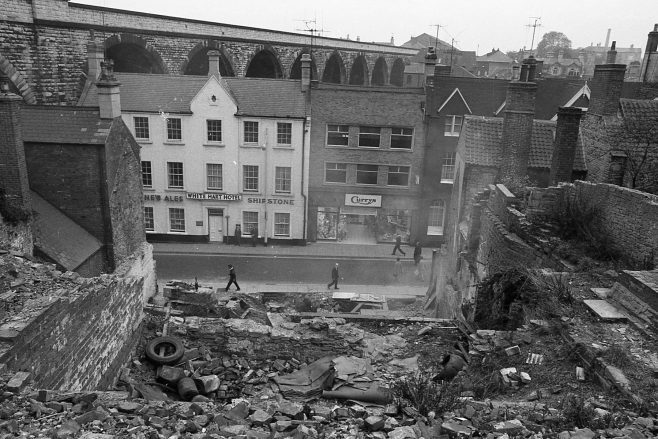 It was demolished to make way for the Nat West Bank I believe. 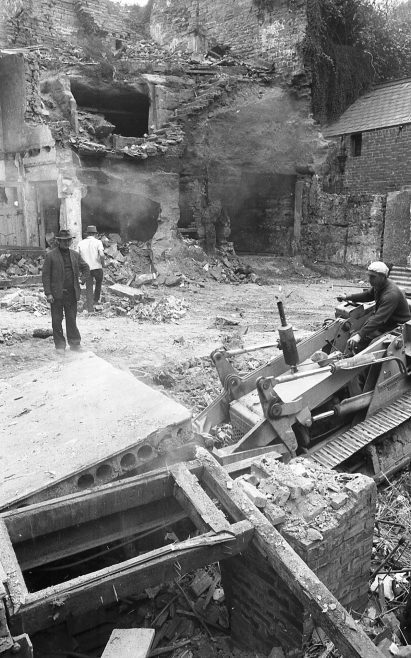 I’m assuming that this would be around 1970/71 when the shops were demolished for the building of Supasave? My Mother worked in one of the original shops that stood there, it was a shoe repair shop (don’t remember the name). Another shop may have been Fords drapers shop. I believe this site is now occupied by the Nat West Bank? In photo 3 and 4 in the right hand corner is the opening to one of the caves that was in the back of the shoe repair shop. I remember it well. The entrance was small, but the cold blast of wind which whistled through it is something I remember mostly. Supasave supermarket, number 9 Church St – also accessible from Toothill Rd. Site is now occupied by NatWest.